This featurette demonstrates how trained dogs are instrumental in helping round up an outlaw Brahma bull which has been plaguing a ranchers pure-bred Hereford cattle. 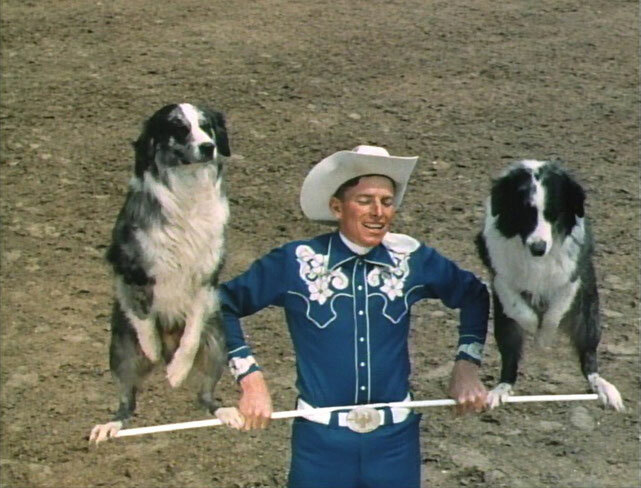 I just watched "Stub, The Best Cowdog in the West" on DVD, and it looks like the first part is this featurette. The additional content was apparently produced in 1973, with additional performances by Slim Pickens and Jay Sisler. Jay and Slim do appear to be older (and Slim is not so "slim"), plus the music in the additional content is obviously from the 70s (my wife said it reminded her a "Quinn Martin Production"). We are Australian Shepherd owners and loved the performances by Stub, Queenie and Shorty. We recommend this movie to any dog lover, but especially Aussie owners. This movie showcases both their natural herding instincts, and their ability to learn a variety of physical behaviors.